I haven't (at the time of writing) seen it myself yet, but the book I spent the vast majority of last year writing is listed in the current Diamond Previews catalogue dated February 2011. I haven't been making a lot of noise about it up until now as (a) I got told off by one of the editors when news of it leaked out too early and (b) I tend to avoid commenting on my projects until they're completed, due to delays and abandonments in previous projects. 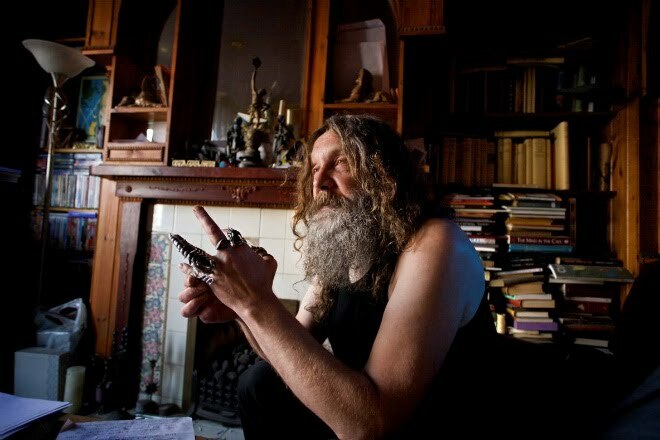 Alan Moore: Storyteller is, I believe, the most comprehensive and accurate biography of one of Britain's most creative minds ever published. It's going to be presented in a lavish format; A 320-page 8.5" x 11" full colour hardcover with audio CD. The book not only includes an in-depth survey of all of Alan's comics creations, but also covers his musical projects, prose writings, magical performances and artwork in some depth. Some of his most renowned co-creators (including Alan Davis, Dave Gibbons, Eddie Campbell and David Lloyd) have provided never-before seen materials; an unpublished script for V for Vendetta, rare artwork (Captain Britain and Watchmen among others) and photographs. Alan himself was incredibly co-operative, generously making time for numerous interviews in person and by phone, providing family photographs and allowing me access to some of his personal notebooks which give unprecedented insight into his working techniques, from Lost Girls, From Hell and Voice of the Fire. Alan has also granted permission to reproduce the entire legendary Big Numbers chart, detailing the whole plot of the sadly abandoned project with Bill Sienkiewicz. I've also attempted to delve into Moore's philosophies, politics, attitudes to drug use, celebrity, the Hollywood system, working routines and methods in order to reveal some of the man behind the hype. The audio CD included with the book is another treasure trove in itself, a compilation of tracks from almost all of Alan's recorded projects, from the Sinister Ducks to the Moon & Serpent Grand Egyptian Theatre of Marvels and including numerous previously unrecorded tracks from the Satanic Nurses and the Emperors of Ice Cream (including the infamous "Mr. A"). All nineteen tracks have been gloriously post-mastered by Alan's sonic collaborator on the audio version of 'Brought to Light,' Gary Lloyd. There's also a bibliographic guide to the most effective way of picking up Alan's printed works and a obsessively detailed timeline of his career in a double gatefold insert. As well receiving materials from many of Alan's collaborators, I was lucky enough to receive reproductions of some of his rarest works from members of the Alan Moore fan community, in particular having tremendous assistance from Pádraig Ó Méalóid who has his own Moore-centric blog Glycon which can be viewed here. Another Alan Moore-related project is not something I would have pursued under my own steam; my personal ambition remains the continuation and completion of Strangehaven as soon as circumstances allow; Alan Moore: Storyteller was commissioned by British packager/publisher Ilex Press, for whom I wrote Comic Book Design in 2009. It will also be published in the US by art books specialist Rizzoli and I understand there is also a French language edition in the works and possibly one or two other foreign editions under consideration. It's due for publication in the spring around May time and you can already pre-order it from your local comic shop, book shop and the usual online retailers. The Diamond Previews listing is here and their order code is FEB111253. *Note: The cover currently posted on the Previews, Amazon and other websites is not the actual cover. As soon as I get the go-ahead on the official, final cover I'll post it here.